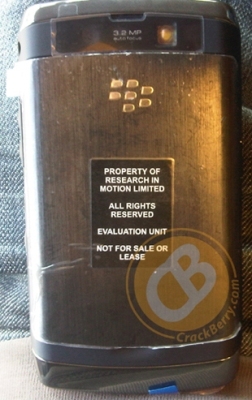 Not one week after the first images of Research In Motion’s (RIM) unannounced Onyx 96xx, a.k.a. 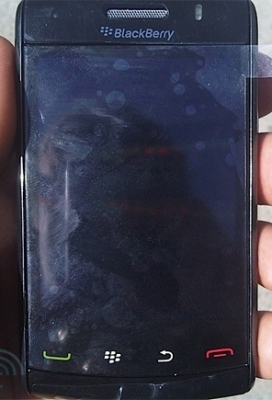 Driftwood, smartphone hit the Web, a handful of pics of RIM’s much anticipated BlackBerry Storm successor, currently dubbed “Storm 2,” have surfaced…and RIM’s pre-release-handheld leak-fest rolls on. We can’t tell too much from the first shots–the new device looks, well, like the current Storm 95xx with a few minor design tweaks. However, rumors suggest that RIM has addressed two of the top complaints about the first Storm: its lack of Wi-Fi and finicky “SurePress” touch screen technology. The Storm 2 will reportedly sport Wi-Fi along with a new, improved “TruePress” screen tech. Let’s just hope RIM and Verizon can brew up a decent software build to go along with the new features and form factor, so we can all avoid the mess that ensued after the first Storm shipped with, shall we say, less-than-perfect code. The new Storm is significantly thinner than its predecessor, and it also appears to be a bit longer. I hate to say it, but the Storm 2 looks even more “iPhone-ish” than the original. Read our review of the newest BlackBerry Curve. There’s a standard 3.5 mm headphones jack at the top of the device’s right-side panel, just like the first Storm. In fact, the sides of the device are nearly identical to the original Storm’s sides, except the convenience keys and volume buttons are flush with the device and are the same dark color so they blend in. The BlackBerry Onyx/Driftwood also has similar convenience key/button-styling, which suggests we may see even more of this on additional future devices. The Storm 2’s display panel looks larger than the original’s, and that can be attributed to the fact that it no longer has individual buttons for Send, Escape, Menu and End Call, like the Storm 1 and most of RIM’s other devices. Those keys all appear to be part of the main screen panel. The pictured device also uses slightly different symbols to represent the Send and End Call “buttons,” though this could be modified before an official version ships. There’s also a lanyard loop on the device’s bottom right side. The device has a 3.2 megapixel camera with auto focus, just like its daddy. And that’s really all we know about Storm 2 at this point…except that there are lots of anxious CrackBerry addicts–myself included–looking for some quality thumbs-on time. RIM won a Mobile World Congress award for the first Storm’s SurePress screen tech–never mind whether or not the honor was warranted–and the device is Verizon’s best selling BlackBerry by a looooong shot. No release date or any other specifics on Storm 2 are available–hell, the thing hasn’t even been announced yet–but rumors suggest a September launch is possible. That’s roughly one year after Verizon Wireless shipped the first Storm, and that timeframe sounds about right to me. So that’s at least three devices–Curve 8520, Onyx/Driftwood and Storm 2–we know exist but RIM hasn’t announced yet.